Are you familiar with GPW and GRUMP? yes Evan, one of the things I’ve been auditing is GRUMP. been using it for a couple years and the figures it gives for low population areas are sometimes wrong. They are wrong because they spread the population out evenly over space. Landscan which distributes population according to physical parameters such as the presence of roads and slopes is thought to be more accurate. So I started looking at the source data for GRUMP which is US census data to see if I could figure out where it was going wrong. and Mckittrick as well has made similar mistakes. 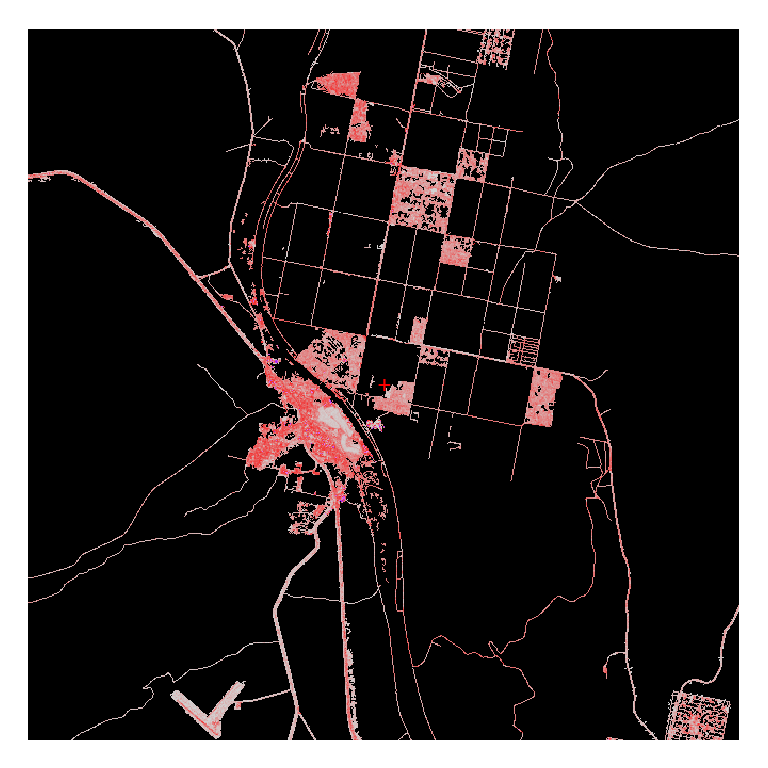 They find a GIS dataset and never check the manual for how it was built. 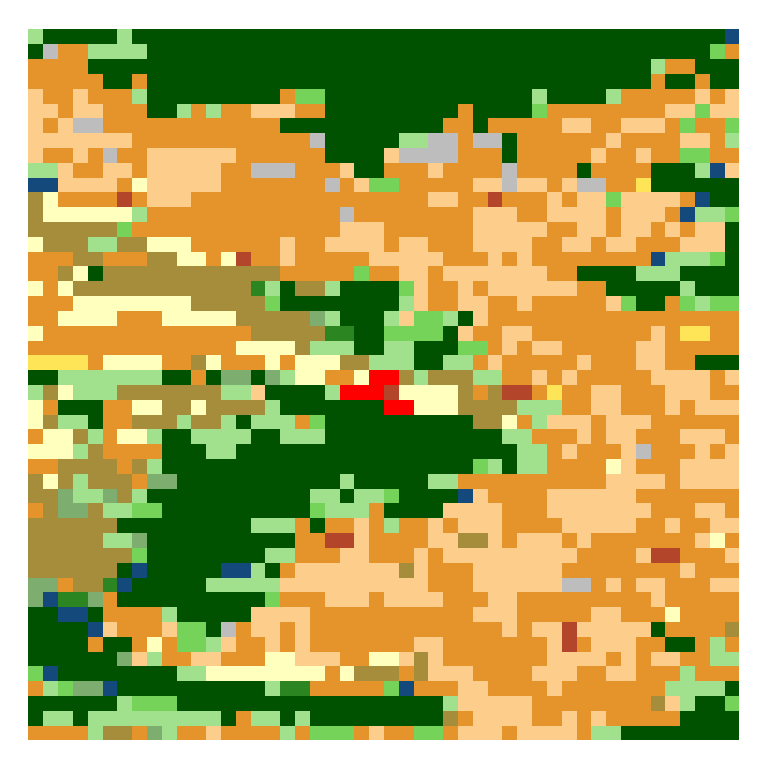 For example, when you check NLCD land cover and find croplands, and check google earth and find croplands and check Grump and find people living in the middle of wheat field that should give you some idea about trusting the veracity of that data at 1km. I commented after a quick skim and missed that you mentioned GRUMP. My view on UHI in general is that it is a real phenomenon that we might call anthropogenic local warming. That is an issue not because the data are erroneous, but because the urban areas are oversampled. The proper way to deal with this is NOT to correct, adjust or homogenize the data, but rather to stratify the spatial estimation. If we had true population density on a 1km grid, we could easily divide the land area into population density tiers, and krige only within tiers. Of course, pop. density is only a proxy for UHI-ness, but at least a reasonable one. Census-based maps like GWP or GRUMP may be crude, but stratification doesn’t have to be perfect to be useful. ISA sounds equally reasonable as a proxy, and may be a better way of classifying stations. 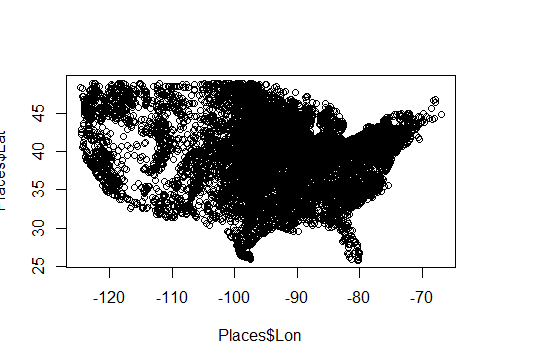 Hopefully this won’t be (much of) an issue when kriging with CRN data. Or will it? I’ve looked at the papers on the BEST methods, They managed to make it complicated enough that I didn’t understand all the detail. But I think i follow the gist of it and see mostly positives and no major problems. I’ll email you with some comments in a day or two. A while back I did some regressions of temperature trend against the Isa Area it was significant in the US. unless the people are living outside buildings on the grass. In any case stratification is kinda what I was shooting for.. once I get a bunch of data assembled. Because you have been looking at the BEST papers and given your extensive background over the years in geostatistics, I have a couple of questions/comments regarding the BEST papers. I found the discussion difficult to follow, but that may in part reflect a bias of my own ‘expectations’ as a result of exposure and practice in a context of contaminant hydrology. I think that the BEST application is a different beast–at least compared to what I have seen. 1.) I was surprised to see no presentation or discussion of local error estimates within the formal kriging process. Or maybe I just missed something in the short discussion under spatial uncertainty. 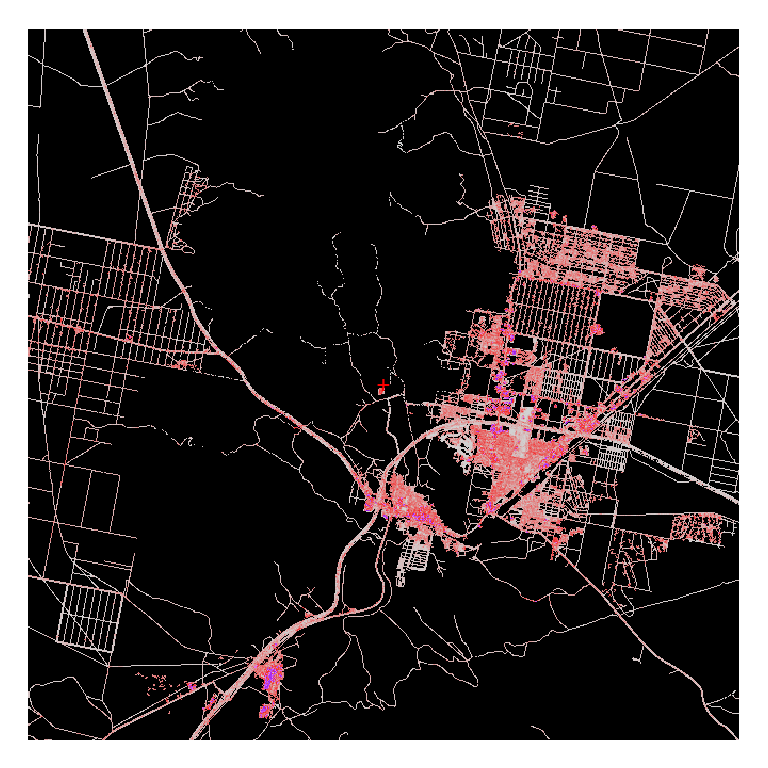 It seems to me that given uneven coverage in observations really suggests taking a look at local error estimates–error maps. What was your read on the topic? temperature at an arbitrary lat/lon/elv is 1.6C. 2.) 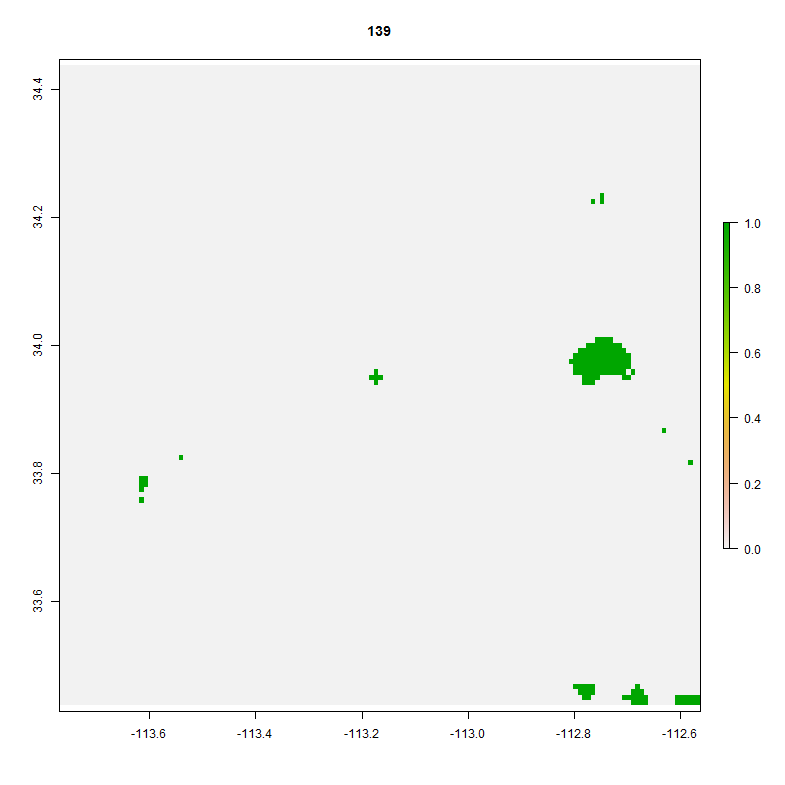 Regarding the oversampling of some areas–are cell declustering or polygonal declustering viable here? a manual judgement process? over sampling is not an issue as far I can see. We’ve done some test with synthetic data, that will get posted in due course. by collecting all the data and running a regression where temperature is a function of lat/lon/elevation and a seasonal component. 3.) I think time will show anisotropy is to important to ignore, and that will be incorporated. In addition to the latitude aspect, many important geographical features, e.g., mountain ranges, are oriented and have a physical scale not unlike the typical correlation lengths seen in the data. geography. I’ve played around with this a lot. The more work you do here the smaller the error in the predicted temperature. 4.) Can variants like probability kriging, logistic kriging, cokriging (e.g., proxy data) maybe bring anything to the table? sorry about that. I run around from place to place and dont always get back to every fight. Steve, thanks for the reply sharing your thoughts as they now stand. It I have noticed you are quite busy. “basically if you have more samples in a given area that is going to be handled in the regression and the correlation length.” I just don’t have a feel for what happens with UK, but what you say makes sense if the correlation function is fit to the residuals from the regression part. But this is not clear to me from the text. (That is an admission, not a question.) If Evan sheds any more light on this particular topic I hope you will have an opportunity to share that. I’ll have to say I don’t know about the prospects of cokriging, logistic kriging, etc. They are possibly more of interest (if at all workable) from the perspective of exploring the relationships between various proxies and temperature estimate-as opposed to the main show of good global temperature estimation. Thanks again for you reply. It has been very helpful. I am a retired geographer who in the 1970s worked a little measuring UHI using an instrumented vehicle and analysing simple max/min data. My background was that I studied with T.J., Chandler, author of the classic 1965 Climate of London and published a bit on the association between UHI and synoptic ‘weather type’. I have only come across this work via my interest in R. and my experience is only in air temperature at screen height, not the surface radiation temperatures sensed remotely, the quantities you call SUHI..
Can I make a few observations about the climatology? If you look at UHI data using the old fashioned comparison approach (which has its faults, read Landsberg on this) what become clear is that the phenomenon isn’t something that is ‘there’ all the time, but which occurs only in some synoptic conditions. These in turn might vary from season to season and by location of the urban areas on the planet. In UK I am reasonably satisfied that the main correlate is the presence of settled anticyclonic weather and UHI are a night-time phenomenon. Chandler attempted to isolate these factors using linear regression, and in my work I simply looked at histograms of the UHI disaggregated by weather type. The issue for climate change studies is the extent to which these UHI incidents contaminate the record by feeding through into the time series. My view is that this is a much more complex problem than is suggested by use of simple corrections based on urban size or population. I should also note that it is by no means uncommon for there to be day-time ‘cold cores’. The second issue is what controls the magnitude of the individual UHI when they occur? 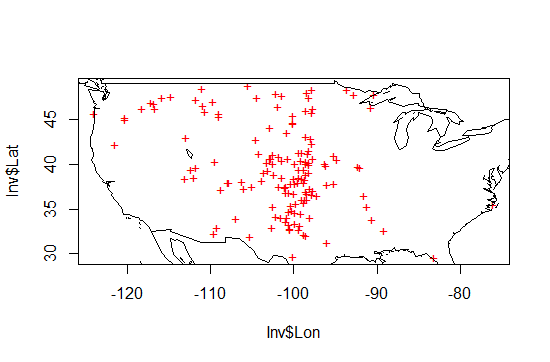 There is a paper by Tim Oke on this issue as well as work by David Johnson somewhere in the literature, but what happens if you look at any two stations, one urban and one ‘rural’ during heat island incidents? Basically what you see is that there is a divergence in the RATES of heating and cooling that itself leads to both the night time heat island and the day time ‘cold core’, So what causes this difference? We are in very settled conditions (bar some UHI induced ‘urban winds’ that will ventilate the urban area) so advected air isn’t an issue. Oke and his team focussed on the near surface energy balance and there are several possible processes, any one of which could generate the observed difference. If you believe it is the lack of transpiring vegetation then using the local amount of built over surfaces might be best, whereas if you think it is flux divergence in the outgoing thermal radiation then some measure of the local urban geometry might be better, and so on. All I know is that in two cities in England the best correlate of the urban excess (found by traversing) was the urban geometry (the height width ratio of the urban canyons) which suggests flux divergence in the urban canopy. So how does city size get a look in? First, I would be very careful in looking at Oke’s paper (and compare it with what is implicit in some of his other later work). 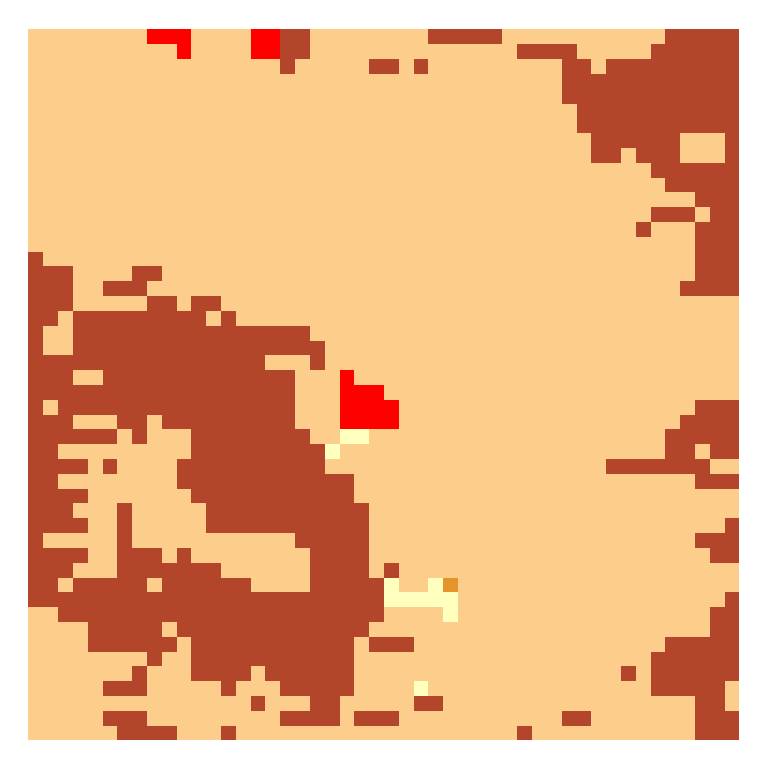 The data were a mix of small settlements in Canada to which he added ‘maximum’ observed heat islands gleaned by writing to friends in the same game (Tony Chandler included) and the literature. Second, he attempted to explain the size by reference to an advective model due to Summers in which the UHI was explained by warming of air advected across the city, so ‘population’ was basically a surrogate for ‘area’. The original paper discusses this link but this is the wrong process and I wish I had kept copies of my later correspondence with Tim in which he admits this (see his work on Vancouver). There may be a correlation with population and/or area, but this is most probably due to some co-variate such as the fact that ‘bigger’ cities tend to have more ‘urban’ cores. dave. Thanks. I agree with everything you say, especially Tim’s work. I wish I could find my lost copy of his 73 paper. 1. synoptic conditions. Yes. I try to make this point in various debates with folks who focus on the MAX. and latent/sensible issues, but the flux divergence is going to be dependent on H/W. Imhoff suggested trying to get building height from “shadow analysis” which is doable. at weekend/weekday deltas. I’ve got some other ideas there as well. it from a lot of various angles. Its like women and men don’t seem to be involved except it’s one thing to do with Woman gaga! something completely, except this post presents fastidious understanding yet. blog, but suppose you added something that makes people want more? please read my post from 2012 on this issue. I hadn’t realised that the clear sky factor would bias the satellite data (great point), but did of course recognise that the surface radiation temperature and the screen height temperature are two different quantities. The Imhof stuff is I think dervied from Oke’s original and deeply flawed paper in AE years ago for which I think I gave the reference — the plot and regression look familiar. Oke dealt with screen temperatures. A useful study which I guess someone must have done is to take simultaneous measurements of both surface RT and screen temperature on a traverse or over a network of fixed stations. 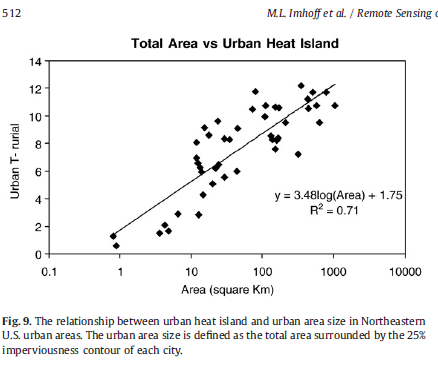 I can only repeat my own observation that you don’t need a ‘city’ to generate a substantial UHI in what I used to call ‘heat island incidents’. I suggest that you traverse a city with a thermometer and make your own measurements in order to get a clear pictiure of what happens. My own village deep in the English countryside, pop=157 or so, can generate +2 K over its surrounds in the screen height temperatures and the key lies in the differences in the RATES of night time cooling. 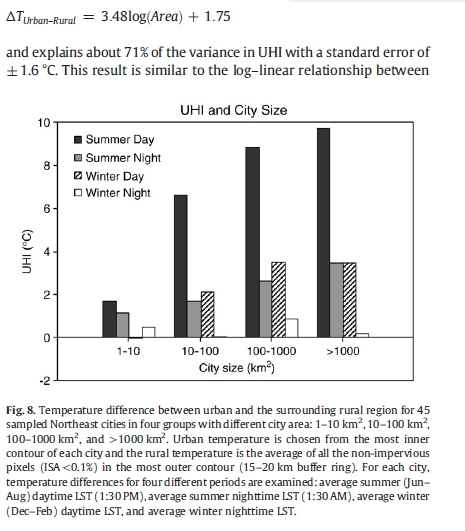 It is possible that you don’t ‘see’ a UHI in the simple temperatures but can measure markedly different behaviour in these rates over rural and urban surfaces. The extent to which a UHI might ‘contaminate’ any long term averages depends on how often this occurs as well as its absolute magnitude as and when it occurs. This magnitude UHI occurs on stable nights with clear skies and low winds, so-called ‘radiation nights’ when the energy balance is dominated by radiative factors. The best correlate we ever found for the rate of UHI development were measures of the relative depth of the urban ‘canyon’ in which the observations were made, suggesting that at least in some mid-latitude cities long wave flux divergence might be a basic mechanism. This does not mean that this is the universal cause of the UHI, things might be different in other climates. There are several studies from the 1970s including a QJRMS one by Tim Oke that support this idea. I suspect that almost all long series climatological records in the developed world will show some contamination.